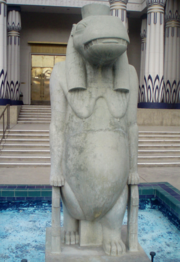 Tawaret is a fertility goddess of pregnancy, childbirth, and the annual flooding of the Nile (with the resultant fertile soil it brings). 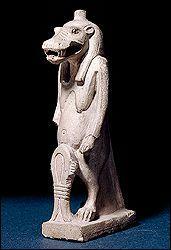 She is typically depicted as a very pregnant woman (with huge belly and pendulous breasts) with a hippopotamus head. 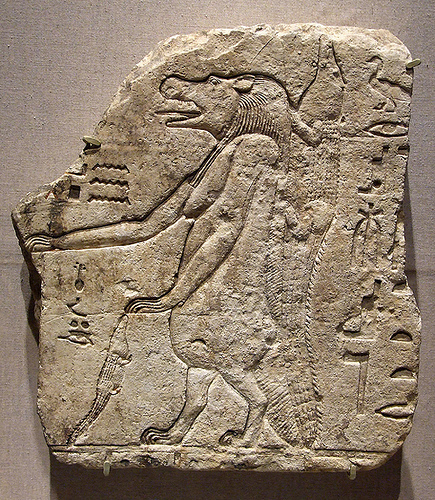 Tawaret is also known as a goddess who protects against evil by restraining it; thus, she became the concubine of Set after his fall from favor in the Egyptian pantheon, and restrains him with a chain from doing further evil.